The Florida National Conquistadors controlled the ball and kept the West Alabama Tigers’ attack quiet in grabbing a 1-0 victory on the road. West Alabama falls to 4-3-1 on the season while Florida National improves to 10-1 overall. 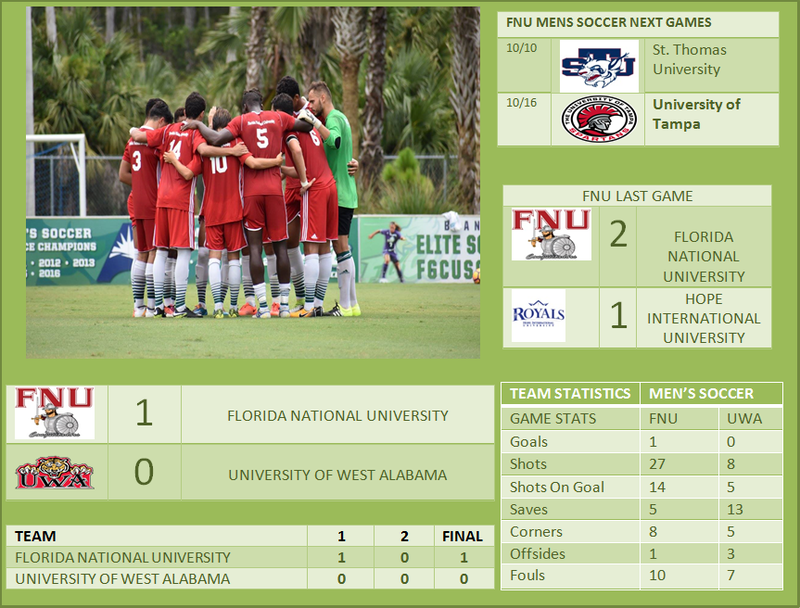 FNU took 27 shots with 14 being on goal while UWA took eight shots total with five being shots on goal. The lone goal in the contest came at the 32:41 when Rodrigo Costa scored a goal off an assist from Martin Marijuan. Amazing away game from FNU Conquistadors. This meeting was the first all-time between both programs. UP NEXT: The Conquistadors will return to Hialeah and will have two weeks to get ready for the next game against Saint Thomas University on October 10th at 4:00 pm. Follow UT Athletics: @FNUCONQUISTADORS on Facebook, Instagram and Youtube.